A. As a pro I see this very frequently. Here are some of the things that I suggest. If you are not taking private lessons, I suggest that you try a few. Private lessons can provide the instructor with the option of introducing new skills that may be more fun than practicing three-turns! Skating must be fun and sometimes that means throwing in a few advanced skills even if the student is not quite ready for them. If you are taking privately, speak with your instructor about how both of you can add some fun to the learning process. Games like skating with beanie babies on the head teach proper body alignment and posture while the student gets a fun challenge. A second part of “fun” is the social aspect. If your child does not have any friends at about the same level who skate, it’s highly unlikely they will continue. Having a friend to practice and play with is an important factor. Inquire about a club. 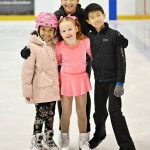 Many rinks have figureskating clubs and junior clubs which could help you find some friends. They also give exposure to higher level skaters which might motivate your child to work harder to improve. Finally, if at all possible try to allow your child to request to go skating instead of prodding them to go. Why? Typical of many kids, anything you want them to do, they won’t be interested in. Good luck and let me know how it all turns out. when i was 6 years old, i wanted to quite Figure Skating. then my parents convinsed me not to. and thats the best thing that i have ever done 🙂 now, i’m 15, almost 16, and i have been skating since i was 5 years old. i think she should keep skating. i have three daughters, 27, 24, and 6. my two older daughters were in ballet for nearly 2yrs before i got sick of the whining and the drama and stopped it. to this day, i regularly get crap about letting them quit (bec they really were talented). also, listen to what she’s actually saying, not just the words coming out of her mouth. “it’s too hard” could actually be “i’m afraid i look like an idiot” or “i’m worried that i’m stupid because everybody else is getting it perfectly and i’m not”.